Garlic and Sea Salt: What's for dinner? Yesterday I was trying to decide what to make for dinner...and I knew it had to be something with eggs, since I had an overabundance of them in the fridge. Since it was a warm day, I thought a salad would be nice...with the poached eggs on top for a nice protein source. I had a bag of mixed greens and some mushrooms as well, so I thought I would throw them in there for a nice woodsy touch. I love mushrooms, and their flavor...especially truffles, but since they cost an arm and a leg I keep truffle oil in the fridge for the flavor. I thought the truffle oil would compliment the mushrooms in the salad well. I combined it with lemon juice in the dressing so the truffle flavor wouldn't be overpowered. 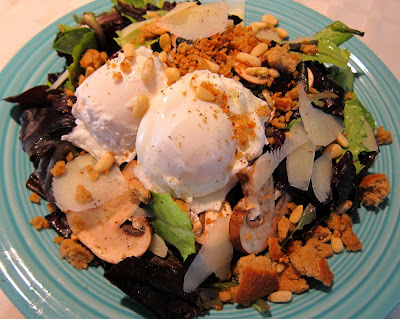 I wanted the salad to contain a bit of saltiness, and crunch as well, so I topped it off with a bit of shaved pecorino romano, toasted pine nuts, and garlicy breadcrumbs...all things that I always keep on hand. For a throw together random meal this salad turned out delicious! To make dressing, whisk ingredients together and set aside. Next, heat olive oil in a small skillet over medium heat, and add garlic and bread crumbs. Cook, stirring occasionally until toasted and fragrant, remove from heat and set aside. To poach eggs, heat water to a simmer in a medium saucepan with the vinegar and salt. Crack an egg into a ramakin. Stir water with a spoon to swirl, and carefully pour egg into it. Let cook for 3-4 minutes or preferred doneness, and remove with a slotted spoon to a paper towel lined plate. Repeat with other 3 eggs. To assemble salad, combine greens, mushrooms, pecorino, and pine nuts in a large bowl. Toss with dressing and divide between 2 plates. Top with breadcrumbs, then 2 eggs per plate. Serve! I tried it and love it, thanks!